Sunday seems to be a prime time for summarizing the weeks Veg.itectural creations... as an aside, I had the opportunity to make a presentationon Veg.itecture to a diverse group of participants as part of the Summer Sustainability Series, which was a great success the past week... and it's true - people respond to the concept of greening buildings, literally and figuratively. 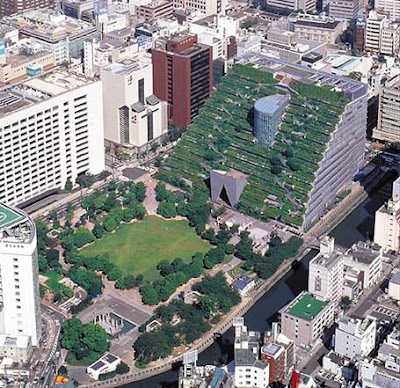 This is reinforced by an article in BDonline, lauding the cumulative benefits of green roofs worldwide. Phil Clark mentions this point: "Green roofs do lots of things in medium ways, but it adds up to quite a lot"
Similar to the recent post on Namba Park, there are some 'old school green roofs', as Architechnophilia mentions in a recent post regarding the very picturesque Emilio Ambasz project Fukuoka's Tenjin Central Park, (circa 1995) which was around prior to the popularity of green roof technologies. Atelier A+D featured some photos from Georg Parthen, including this image of earth sheltered design. 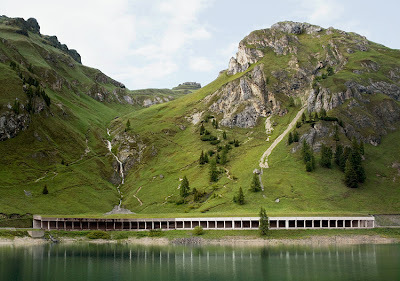 Another example of buildings tucked and folded with the landscape is via Arch Daily. 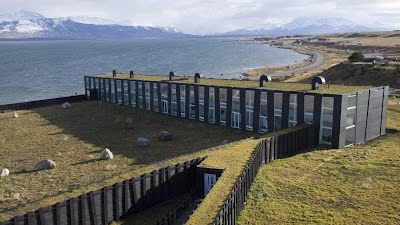 The Remota Hotel by Architects: German del Sol is located in Chile, and features some stunning and simple rooftop greening. 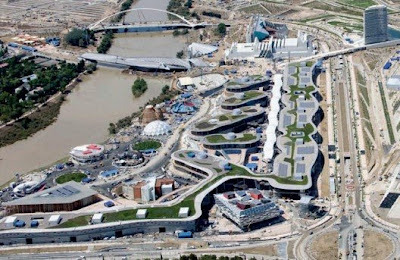 Another extensive rooftop span, via Arch Daily, of: "...the Expo Zaragoza in Spain (June 14th - Sept 14th) features an astonishing pavillion/bridge by Zaha Hadid, and buildings by spanish architects Nieto y Sobejano, Francisco Mangado and Basilio Tobías." Having been involved in a number of hospital and healing projects, the idea of views from building windows is always on the table in terms of rooftop greening. 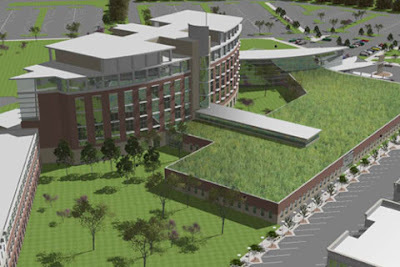 It also feeds into the recent popularity of incorporating LEED and sustainable strategies into heathcare as well, with those multiple green roof benefits adding up to a good number of site points. A post in Urban Palimpsest features the LEED registered Metro Health Hospital in Grand Rapids, Michigan. This is a "...LEED registered facility that includes same-handed design in the rooms. Patient rooms look out onto the green roof below." 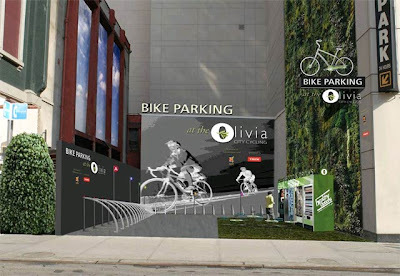 A couple of green walls as well... the first a great representation from I (heart) Public Space, along with some refined bike facilities at a project in NYC. 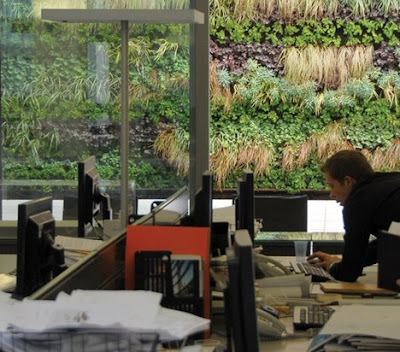 Finally,, an example of being both experimental and innovative from a design firm (I'm trying to get our office to do as well...) Via BDonline the architectural practice David Morley Architects: "...has installed an experimental green wall project in its office courtyard. 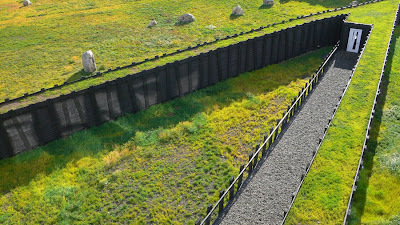 The wall, designed by specialist firm Biotecture, has been planted with a variety of specimens. It is designed to cool and insulate the wall’s surface, and to allow water to evaporate. The project, which began as part of the London Festival of Architecture, is also expected to improve air quality, noise attenuation and carbon offsetting, and possibly rainwater harvesting. David Morley Architects and Biotecture are also working with services engineer Max Fordham to investigate whether green walls can cool building interiors." Those are all really interesting photos. It makes me wonder why more cities and states don't take the time and effort to create more green friendly spaces by simply planning and using vegetation.